For the last couple of weeks I have been thoroughly investigating the Unity 3D game engine (version 4 was just released today) and what I have discovered so far has utterly blown me away. I was stupidly thinking that all Unity was good for was little casual web-browser games and some puny phone applications with visuals straight out from the 1990’s. And boy was I in for a surprise! Awesome to see progress..! If i may request, make a small video of the mouse doing battle with a foe in gameplay when you can. And is Unity really so much easier to handle than the CryEngine ? And is Unity easier to handle than the CryEngine? Yes. A LOT. It’s like night and day. I am kinda stuck with the cryeengine also. Do you have some tutorials/videos how to start with Unity? Like how to make landscapes etc? I realize you’ve posted this in 2012, but now that we’re in 2015 what do you think about Unity in comparison with Cryengine? 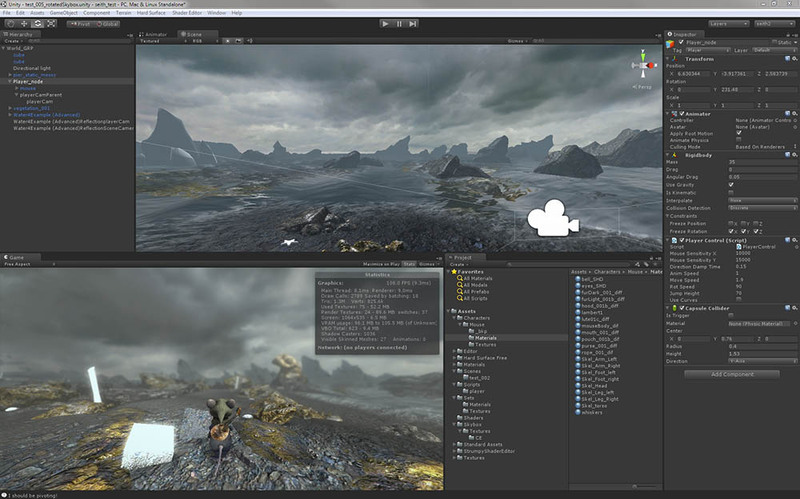 Unity 5 is coming out and so is Cryengine 3.7. I’m mostly interested in the amazing visuals of Cryengine straight out of the box, but some things are really annoying whereas in Unity it’s quite straightforward to do almost everything. The thing that pisses me off about Cryengine most is that I can’t easily, if at all, do similar long distance shots like the ones above. Your screens from Unity 4 look spectacular, I wonder what Unity 5 will bring to the table with the PBR shaders and the new lighting. As far as I’m concerned the visual gap between the CryEngine and Unity (5 especially) is small enough that I don’t miss it anymore. Unity allows me to do stuff I could only dream of in the CryEngine; not because it couldn’t do it but because I wouldn’t technically be able to. The CryEngine (as well as Unreal Engine 4) requires a team of developers to do a game. Using Unity I can build Ghost of a Tale on my own. And that’s what makes the difference.